In Part I of “The Worst Ever” we dug deep into our own past, found the bloodiest wounds, and compared battle scars. 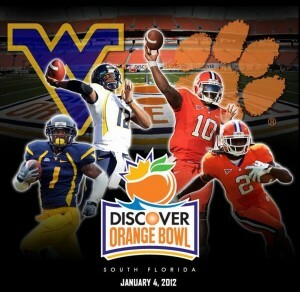 And by doing so, we determined this year’s Orange Bowl still hurts the worst. But the pain is over. We served our sentence and now it’s time to turn our attention to our fowl-feathered friends. In this post, we’ll dig through their lustrious* past, find their bloodiest wounds, and compare their battle scars – in an effort to determine which loss still hurts the worst. We will use similar criteria to Clemson’s analysis: Stake, Stage, Score, & Opponent. In 1984 USC was having their best season - ever. They were 9-0, including a win over Florida State, and ranked #2 in the country. The Sugar Bowl wanted the Gamecocks, and would take them win or lose, if they would commit before playing Navy. The Orange Bowl also wanted the Gamecocks, as long as they were undefeated. USC declined the Sugar in hopes of the Orange. USC promptly lost to Navy and the light went out for both. And to this day, they’ve never been invited back to either. In 2001, USC was 7-2 (5-2) with a chance to head to the SEC Championship Game. In preparation, USC organized a “Black Out” to try and push their team to victory. And things looked promising early as Florida looked rattled and they scored the game’s first points. They then led 10-3 before Florida answered with 44 straight points to silence the crowd and end USC’s chances at the division title. In 2010, USC was able to get over the hump and win the SEC East Division Title and earned a chance to play undefeated Auburn and Cam Newton. The winner gets a BCS Bowl Bid, which USC had never played in. USC kept it close for a while, but in the end Auburn & Cam Newton totaled 56 points, the most ever in an SEC Championship Game, and won by 39, also a record. When looking at the games, the Navy game is the cost USC the most while the Auburn game is the most lopsided. Winner – Navy, by a sailor’s cap. The very thing that makes Clemson’s Orange Bowl loss so painful is not in play for USC - they’ve never been to a BCS Bowl. But they have played for an SEC Championship Game, which is a major accomplishment. Unfortunately, as we saw earlier, the game didn’t go well. And because this game remains the biggest game they’ve played, it also remains as the worst, with “Black Out” number two. Let’s be honest – any game we are discussing will have a lopsided score. We don’t always remember the close games, but the blowouts stick in our minds forever. And the score is usually a major component. In addition to the games mentioned earlier, 1988 versus Florida State (57-0), 1989 versus Clemson (45-0), and 2003 versus Clemson (63-17) also come to mind. For Clemson, losses to Duke, Wake, Syracuse, & UNC hurt, about as much as losing to Vanderbilt. But those guys are all D-1A – and out of state. For USC, the loss to the Citadel in 1990 has to be one of their lowest moments. But is it lower than losing to your arch rival? Is a three point loss at home to an instate D-1AA school worse than losing at home by 45 or 46 to your rival? Ultimately, the Clemson losses may be worse in that they cost USC something – a bowl bid. In 1989, getting a bowl invitation was considered a big deal – and it would give USC an opportunity for their first bowl win. Similar to 1989, in 2003, USC needed one more win to become eligible. In both cases, they stayed home. The Auburn loss was bad due to the stage and what was at stake. The Florida State game was the most lopsided. The Citadel loss was the most embarrassing. But the worst loss? 2003 to Clemson. 63 points to your instate rival – at home. Bowden’s lip was quivering during a press conference when asked about job security. It’s the worst loss in the series, keeps you from bowling, and the memory of it hangs in your rival’s stadium. 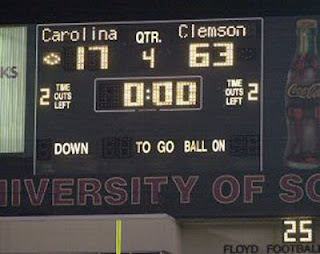 Stay tuned for Part III as we determine which of these two losses: Clemson in the Orange Bowl or USC to Clemson in 2003 is crowned the worst of the worst. Since the Orange Bowl, USC fans have enjoyed nothing more than ragging Clemson fans. Almost as much as Clemson fans enjoyed ragging USC fans about 63-17. And there doesn’t seem to be an end, or winner, to this argument. So The Tiger Swag will attempt to analyze the Orange Bowl loss, determine if it is the worst loss in Clemson history, and then compare that loss to the worst in the USC history books. This may not be fun, or easy. But it must be done, because Bragging Rights are at stake. Coming into the 2011-2012 men's basketball season, something had to give. Programs typically take the biggest leaps forward during year two as returning players have been through a complete cycle, know what to expect, and know how to prepare. But this Clemson team was a little different than most. They lost 3rd Team All-ACC player, point man, and court leader in Demontez Stitt and All-ACC Defensive player Jerai Grant. Additionally, only had six players with varsity experience were returning. So which would it be - historical growth or the fresh faces? Brownell knew that until the six freshman figured out the system and their role in it, there would be some bumps and bruises. Their defense and intensity would keep them in games, but the lack of a consistent scoring threat would cause some issues. And it did. The inexperience and lack of scoring cost them as they were unable to put two halves together. Back-to-back home losses to the College of Charleston and Coastal Carolina showed just that. 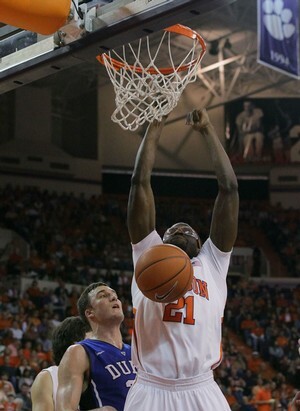 Against the College of Charleston, Clemson got down early by double digits, but stormed back to have a chance to tie. It didn't fall and they lost by three. Against Coastal, it was the opposite. Clemson jumped out to the big lead, but Coastal flipped the tables, made a comeback, and stole the game at the buzzer. The ACC-B1G Challenge would give us our first glimpse of what this was capable of as they dominated Iowa on the road. But unfortunately, the inconsistency returned and they lost at home to a terrible USC team. Another loss to a decent Arizona team on the road was not a surprise, but their effort in Hawaii was. They lost their opener to a mediocre UTEP team, rallied to beat Southern Illinois in overtime, then lost to the host school Hawaii in the 5th place game. The result - a sixth place finish in a less than stellar field and the suspension of a key player. Jennings was suspended for the finale due to his actions on the court. And as we found out later, there were academic issues as well. But all was not lost. Clemson again showed what it was capable of doing in dismantling FSU in the ACC opener, but inconsistency reared her ugly head as the Tigers lost three straight heartbreakers in ACC play. It was now official - inconsistency and heartbreak were to be the themes of the season. Following back-to-back wins over bottom feeders Georgia Tech & Wake, the Tigers again lost three straight ACC games, two of which were on the road, by a total of eight points. What might have been became the discussion of this team. An extra basket here or defensive stop there, or maybe a little less of Karl Hess, and this team would be near 0.500 and in solid position for postseason play. But the breaks didn't fall their way, and as such, being 3-6 in the ACC, combined with the early season struggles, the prospects of heading to the NIT, nevertheless the NCAA Tournament for a record fifth straight year, were essentially erased. But give the players and Brownell credit. They didn't give up and were able to win five out of the next six games, including wins over NCAA teams Virginia & NC State to assure themselves of at least a 0.500 record in the ACC for the fifth straight year, which extends their best-ever run. The only loss in that stretch? The extension of "The Streak" in Chapel Hell. Clemson ended up losing the regular season finale at Florida State and the ACC Tournament opener to Virginia Tech to finish the season 16-15 (8-8). Looking back, the Tigers have a lot to be proud of. They were one break away from finishing 4th in the ACC and potentially extending their season into the postseason. In addition, the four seniors showed tremendous leadership and the six freshman began to find their place. This team played hard, never gave up, and grew as a team. By the end of the season, they were playing solid basketball. At that is what this team will be remembered for: senior leadership, impact freshman, and never giving up. And because of that, this may be my favorite senior class since Barnes' Slab Five. Thank you Andre Young, Bryan Narcisse, Catalin Baciu, and Tanner Smith.